The Knitting Pirate » In Which the Pirate Buys More Yarn. « In Which the Pirate Contemplates Spinning. In Which the Pirate Buys More Yarn. Just what I needed, eh? 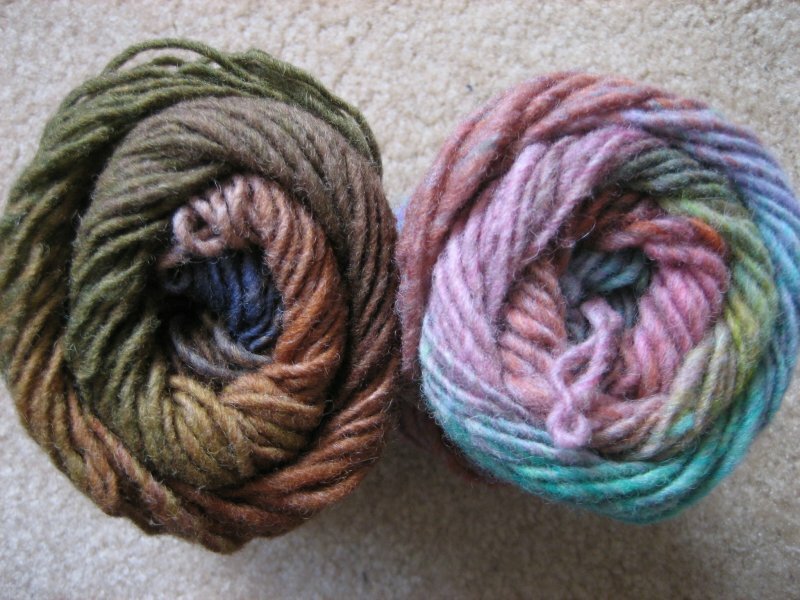 Here are colorways 178 (left) and 215 (right), which will keep the Stripey Striped Scarf from being too short. Woolwinders didn't have more of either of my first two colorways; not too surprising with Kureyon. So I picked two others that I thought went together well, and would match with what I had. Another woman in the store commented about Kureyon's colorways; I forget what she said exactly, but it was like, "that's nice.. that's nice.. what the hell is this color doing here? ahh, that's nice again." 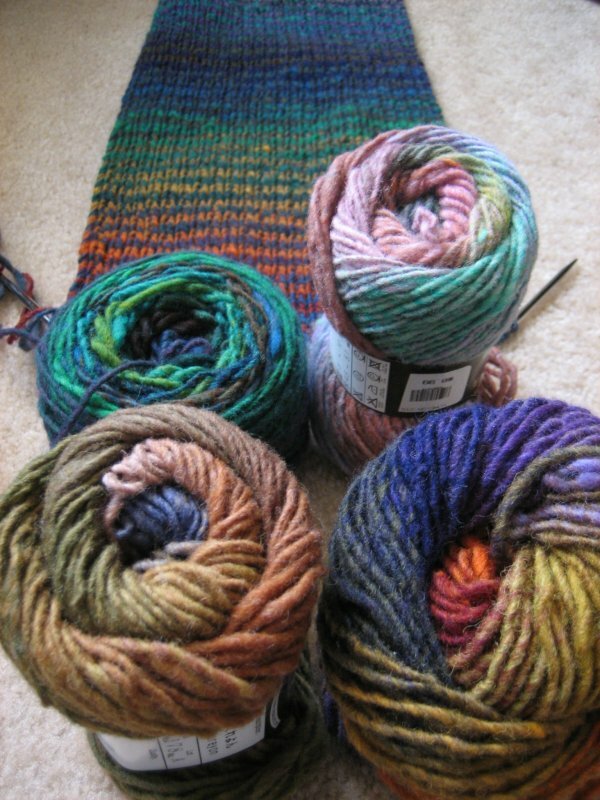 At first I thought of putting the two new colorways together in the middle of the scarf and having the ends match. Then I realized there is no matching. Each ball starts in a different place in the colorway, and who knows how things would line up? I was also a little concerned that there would be a really obvious break where I changed colors. So here's what I'm going to do: The new 215 will be paired with the old 148 for the middle of the scarf, and then the new 178 will be paired with the old 185. This way each duller color is paired with a brighter, and no two colorways go together twice. Maybe I'm overthinking this just a little! I'm sure it will look perfectly fine - and perfectly hideous - no matter which way the yarn goes. And by hideous, I mean fantastic. This thing is just too cool! This entry was posted on Saturday, June 23rd, 2007 at 20:49 and is filed under scarf, stripey striped scarf. You can follow any responses to this entry through the RSS 2.0 feed. Both comments and pings are currently closed.